A new Housing Strategy to cover York, North Yorkshire & East Riding for the period 2015 - 21 has been drafted and recommended for adoption by the Housing Board to the constituent Local Authorities. A final version will be available shortly once each local authority has formally adopted the document. The strategy and the Housing Board action plan will be underpinned through local action plans produced and delivered by each local authority partner and through action plans delivered via the sub groups such as the Rural Housing Enabler Network and the Private Sector Housing Group. Each Local Authority will develop a separate homelessness strategy to cover their area. If you would like to discuss the strategy and its priorities in more detail, please contact Sarah Hall. 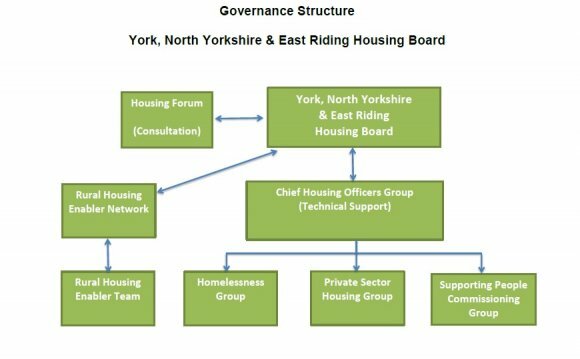 Shaped by two rounds of public consultation, in March 2009 and January 2010, the North Yorkshire Housing Strategy was subject to a light touch review in summer 2012 and now includes greater emphasis on homelessness issues. The strategy has also been renamed and is now called the North Yorkshire Housing and Homelessness Strategy. "To make North Yorkshire and York an inclusive place where communities are sustainable and residents can have fair access to decent affordable homes and effective support when they need it." The strategy and its strategic action plan were be underpinned through local action plans produced and delivered by each of our local authority partners and through shared action plans delivered via specialist sub regional groups such as the Gypsy and Traveller Steering Group and the Private Sector Housing Group.